Nachos are a go-to delicious and easy snack. It doesn’t take much more to prepare them than simply tossing them in the oven with some shredded cheese. In this recipe, we up the ante by replacing tortilla chips with soft, pillowy potato and cheese pirogies. 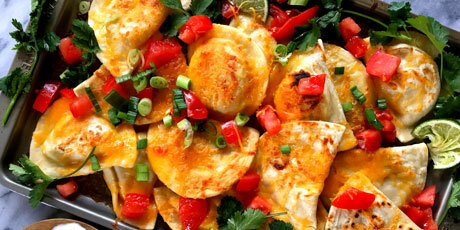 Pierogis should not only be served with sour cream; they’re so much more fun with the classic toppings of nachos. 2. Boil a large pot of salted water. Boil pierogis until cooked through, about 3-5 minutes, then drain. 3. Heat butter in a large frying pan over medium-high. Fry pierogis until golden and crisp, about 3-4 minutes per side. 4. Arrange pierogis in a single layer on a rimmed baking sheet. Place cheddar cheese over pierogis. 5. Bake in preheated oven until cheese is melted, about 10 minutes. 6. Remove from oven and sprinkle with green onions and tomato. 7. Serve immediately with sour cream.